Konrad (Conrad) Repp was born in April 1857 in Norka, Russia, the son of Peter Repp (born 1828) and Elisabeth Döring (born 1832). Conrad married Anna Maria (Emma) Weidenkeller on April 24, 1878 in Norka. Emma was born in Norka on May 23, 1856. Conrad and Emma lost several children at an early age. Their son George, born January 28, 1886, would accompany them to America and later return to his native Russia to help save thousands of lives. Conrad and Emma decided to immigrate to the United States in May 1886, along with Conrad's parents and his siblings George and Elisabeth. The family departed Europe from Hamburg, Germany and Le Havre, France and arrived in New York on the steamship Suevia on July 1, 1886. The Repp's initially settled in Sutton, Nebraska where Conrad found work with the Union Pacific Railroad. Conrad's father, Peter, died in Sutton. In the spring of 1890, Conrad's family and mother migrated westward to Portland, Oregon. The Repp's first settled with about 15 other Volga German families at the foot of Russell Street near the Willamette riverfront on land leased from the Montgomery Estate. Here they remained until the spring of 1894 when the Willamette River overflowed and carried many of their homes downstream. This entire group of Volga Germans then moved up the bank to the area around Union Avenue (then Margaretta Avenue) when the earliest Volga Germans had settled in the early 1880's. The Albina City Directory shows the family residing near Russell and Margaretta Avenue (later Union Avenue and now MLK Blvd.). Conrad worked as a laborer and in the garbage hauling business for several years. The Repp's traveled to Portland with the John O. Miller family. Conrad and Emma were charter members of the Ebenezer German Congregational Church that was founded in 1892. On February 1, 1899, just nine years after the family's arrival in Portland, Conrad had saved enough money to buy a store with grocery stock at 760 Union Avenue North, near the intersection with Beech Street (now 3536 MLK Blvd,). Son George was working a clerk in the store in 1900. Conrad and Emma's family had grown to four children with the birth of Paulina (born on July 4, 1889 in Sutton, Nebraska), Adam (born October 2, 1892 in Portland) and Magdalena (born January 5, 1895 in Portland). Paulina (Pauline), married John H. Sinner on January 1, 1908. Conrad partnered with his son-in-law John, and for a number of years the store was named Repp and Sinner Grocery. Conrad sold his business in July 1908 and he then bought a 300 acre farm in Kalama, Washington. George and his brother-in-law, John H. Sinner bought the store Conrad had owned and went into business together as Repp and Sinner Grocery. In 1915, George decided to go into business on his own and sold out his interest to John Sinner. It appears that John Sinner continued to operate the original store until the end of 1919 before selling out to Alexander and David Hildermann. 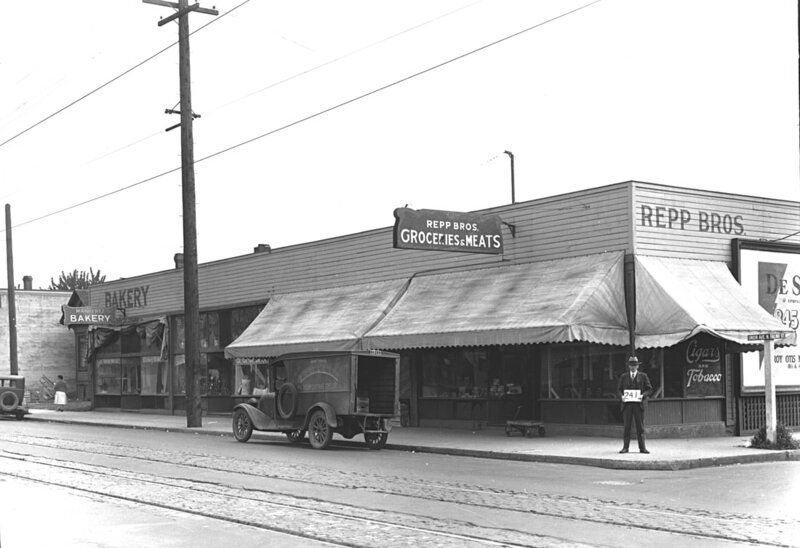 Brother Adam, later joined George and the business was renamed Repp Brothers Grocery and Meats. A new location was opened about two blocks south at 3904 NE Union (at the northeast corner of intersection with Failing Street). Conrad Repp died on August 13, 1916. Repp Brothers Groceries & Meats at 3904 NE Union at Failing Street. Repp Brothers was a mainstay for many in the Volga German community. Many recall that groceries could be bought on credit in the winter and the bill settled during the summer after farm workers were paid for berry, hop, and bean picking. George helped found the Volga Relief Society in 1921 to help his countrymen who were suffering from a severe famine in Russia. George left the business in Adam's hands while he acted as a representative of the relief society and the American Relief Administration in Russia. George's work saved countless lives in the Volga German colonies. In 1939, George sold his interest in the store to Adam's son, Earl George Repp, who continued operating the store and expanded into the wholesale meat business. Repp Brothers remained in operation until 1969 when increasing vandalism in the area caused the third generation business to consider closure. Further impetus to close was provided by the City of Portland who would no longer allow meat to be processed at this location. This area along Union Avenue which was slated to become part of the Model Cities Program, an effort to revitalize the area that had very limited success. Robert Repp, son of Earl Repp. "Signs Point To Urban Wasteland As Troubled Area Loses Stores." The Oregonian [Portland], June 19, 1969, page 14.